A responsible Business an ethical adventure. Altrocanto is housed in a building that was built in the early 1900s as a furnace and then converted into a dwelling house in the 1920s. The house has been left abandoned for many years until the idea of restoring life to it was born in 2007. The conservative recovery intervention has consolidated, with respect, the old structure, paying close attention to its safety in accordance with the anti-seismic regulations and the implementation of energy efficiency. The thickness of the old stonewalls, with their outstanding strength and high insulating power, have been maintained, while the concrete roof of the 1960s has been replaced by a new ventilated wooden roof, that, besides giving charm, gives energy saving and static lightning to the house. Great attention has been paid to the choice of materials: wood, stone and brick for coatings, wood for thermal break fixtures, plaster and paint based on natural pigments and without chemical solvents (Springcolor), oil flax and bee-wax for wood-impregnating. 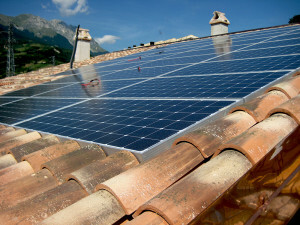 The house is equipped with a photovoltaic system, for the production of hot water; the heating system is powered by a biomass boiler burning exhausted olive residues; rainwater is recovered and used for the garden; separate collection of inert material is carried out, while organic waste is used for composting to make the entire structure eco-friendly as high as possible. The water we offer at the restaurant and the water in the rooms is that of the faucet of Farindola, of excellent quality. Cleansers and detergents used for cleaning and washing are hypoallergenic, non-irritant, nickel tested and with easily biodegradable surfactants. We make the soaps in our rooms with olive oil and a few drops of essential oils. Banca Etica has recognized the environmental commitment and respect for the territory, which we have followed for restructuring and guiding of our business. Thanks to the idea that our company can generate not only profit but also and above all utility for the community, in the sense of a common and good economy, of the production of social value, Banca Etica has decided to support and accompany us in our business. Thank you!